As you may have read in my last post and my occasional tweets, I’m getting all worked up at work and am having a stressful time there. So when I do have any spare time in evenings or on weekends, I try my best to de-stress. 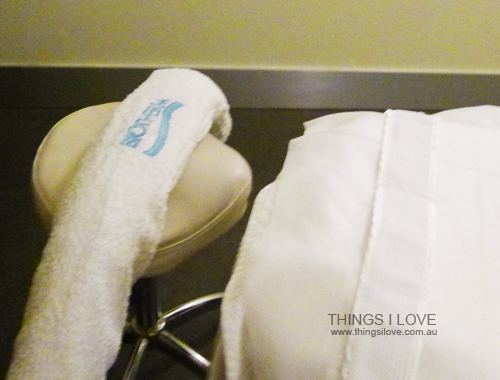 And let me tell you there is no better way than for a little massage and getting a pampering facial. And I received one recently at Myer Melbourne city store! 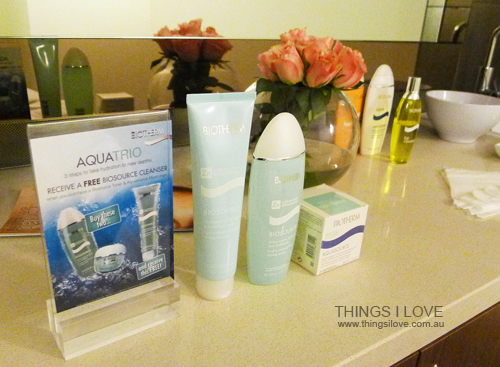 Two Saturdays ago, I was treated to a relaxing facial at Biotherm. Before you start thinking that the facial occurs at the counters – they don’t. 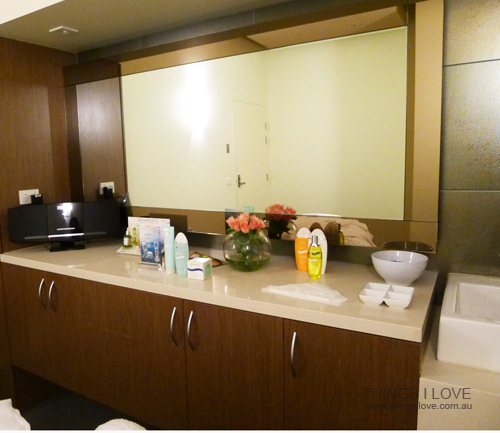 There are actually spa rooms that provide privacy and serenity, away from the hustle and bustle of the busy store in the back area of the store. Upon entering the spa room, I was instantly relaxed with beautiful mood lifting tunes, I was given time to change into a robe and wrapped myself in the spa towel before sleeping on the fluffly warm bed. There, Peou, my amazing Biotherm facialist asked about my skin concerns whilst she proceeded to cleanse and remove dirt from my face and I told her pigmentation, fine lines and tiredness were my main current problems. After that assessment, she applied a mask to my face, neck and décolletage and gave me the most amazing massage on my neck and upper shoulder whilst receiving a facial. I literally felt my knots being soothed away. In fact, Peou was so good with her hands, she almost had me drifting into a blissful sleep. 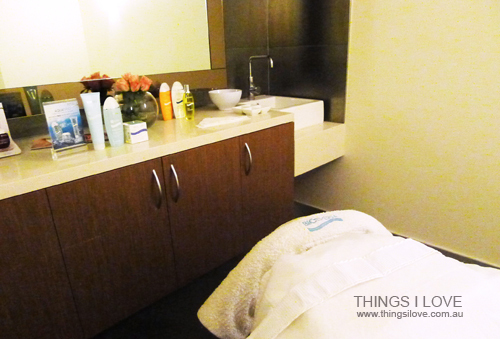 She even applied a beautiful citrus body milk onto my arms and massaged it all in – heaven! After what must be a good 45 minutes, I was all hydrated, smoothed and relaxed and Peou sent me off back into the hustle bustle with an application of toner to remove any mask residues and good slathering of the Biotherm skinergetic serum to help combat my fatigued skin and the White D-Tox Intense Brightening cream to help fight my pigmentations spots. After all that pampering, I was so relaxed I could have tackled anything (or just head back to bed and sleep some more!). Now, if only I can get pampering like that every week! If the idea of a Biotherm Facial takes your fancy and you are in Melbourne then you are in luck as the wonderful Peou will be working more of her magic at the next facial event. Be sure to book an appt today! 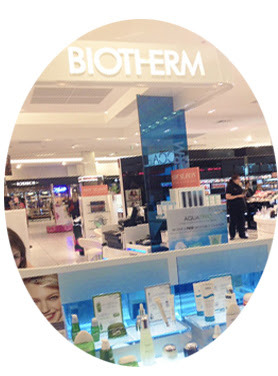 When: the next facial event in Myer Melboune starts on 4th April and will runs every 6-8 weeks in-store. Other Myer stores are also running these facial events so if you are keen, be sure to give your local one a call to check the details. This service was provided for consideration. This looks amaaaazing, I had no idea they had the rooms in the back like that. I like the idea of a mini massage being involved in the facial, it's a lovely touch. Ah, I had one too - it was so good to be pampered! @Emmabovary - I didn't know either... it's not well advertised I would say but it's very lovely. Would do it again. @Ling - isn't it just so divine? Glad you liked yours too. A little Update & New Blog!